This month’s feature food is the Lӓrabar. Lӓrabars are a brand of granola bar that are made with only dried fruit, nuts and spices. They do not contain any added sugar or syrups. They are moist, soft and chewy. Some of my favorite flavors include apple pie and cashew cookie. I suggest Lӓrabars to clients as a satisfying snack that is high in fiber and healthy fats, and moderately high in protein. The Lӓrabar brand now has several products as well including the original bars, mini bar variety packs that contain two different flavors, fruit and greens bars that contain vegetables, such as kale, and ‘bites’. I recently tried the Double Chocolate Brownie bites and they are delicious - what a healthy way to tackle that mid-afternoon sweet tooth or a healthier option to pair with your cup of coffee. Similarly, the mini bars allow you to grab just one or two and can help satisfy your sweet tooth. I tried the fruit and greens bars for the first time recently and didn’t like them as much as the original bars. You can find Lӓrabars sold by the box or as individual bars. The individual bars are nice because they allow you to try different flavors to discover which you like. If you don’t find Lӓrabars in the grocery section of your store check the nutrition section of the pharmacy - sometimes they can be found here. Lӓrabars are gluten-free and dairy-free, for people where that is a concern. They do, however, contain nuts. 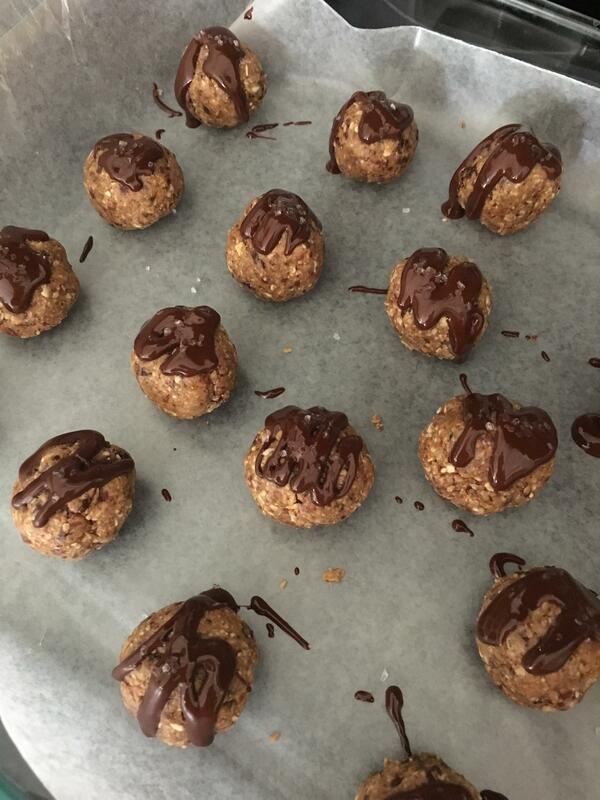 Homemade energy bite recipes have similar ingredients to Lӓrabars and can be fun to make. Check out this month’s recipe, Cherry Almond Energy Bites, for one version of this popular snack. With a few tweaks you can change this recipe up as well. For example, substitute an alternate nut butter for the almond butter - try peanut butter or cashew butter. Use the dates as your base dried fruit, but try swapping out the cherries for a different dried fruit. Experiment with different toppings. Soon you’ll be creating your own favorite energy bite recipe. 1) Combine all ingredients in a food processor. 2) Roll into balls and place on a cookie sheet. 3) Top with melted dark chocolate and sea salt. 4) Freeze 1 to 2 hours and store in the freezer or refrigerator.